The very back of my mother's black book has a section on entertaining - a diary, if you will, recording dates and guests and menus for parties. 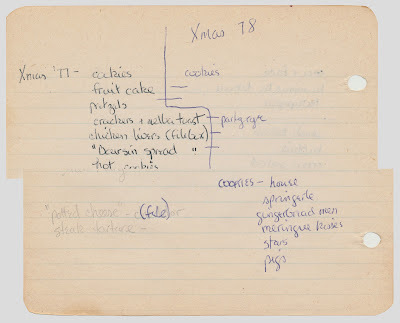 And when I look at the page of her notes on the Christmas Eve party, it's like a road-map. This is what you serve for an open house. This is how you do it. You have cookies, fruitcake (my grandfather sent us one every year), pretzels, crackers & melba toast (which you make out of party rye). You have hot cookies (spicy cheesy sesame shortbread "pennies") and "Boursin spread" and chicken livers. Later, sometime after 1978, we'd add cheese and pickles and olives and nuts to the menu, and eventually the fruitcake stopped coming. Oddly enough, the recipe for the chicken livers wasn't in the black book - it was in the file box. But I'd once copied it into my own recipe book, and, because I'm a good sharer, here it is, down at the bottom of the page. Make it for your next open house. People will love it. Parties always want crunchy cheesy things. For the open house we had before Christmas, I included John Wm. Macy's crunchy cheese sticks, which are the kind of thing you find at fancy parties and can't stop eating. Truth be told, I had them in the house because a publicist sent me some, but truth be told? They're really good and I'd buy them again in a minute. The other crunchy cheesy thing I served was a sort of apple/onion/blue cheese pizza, from a New York Times recipe. It was easy to make, and cut into 2" squares, it got scarfed down by the wine drinkers who never left the kitchen. What is it with the kitchen? Always have some food in the kitchen at your open house, because some people never leave there. Melt one stick of butter. Sauté the livers in the butter until brown outside but still pink inside, about 5 minutes. Set aside to cool, in the skillet, until the butter firms up. Transfer to a food processor. Add the second stick of butter and mash to a nice paste. Add other ingredients. Transfer to a serving dish - I like to pack it in a crock or something where you can smooth over the top. Serve it with melba toast, the kind you make yourself out of a loaf of party rye, stuck in a low oven for a while. Note: I always add the dried basil, though I don't know why. And I never add the anchovy, though maybe one day I'll be brave and try it. Disclosure: I didn't buy the Macy's Cheese Sticks; the publicist sent them to me. No one paid me to write about them, and my opinions are my own. "What would it take to get a publicist to send me stuff, too?" I remain fascinated by your mom's various notes and collections. Truly. I swear our mothers were cut from the same cloth. 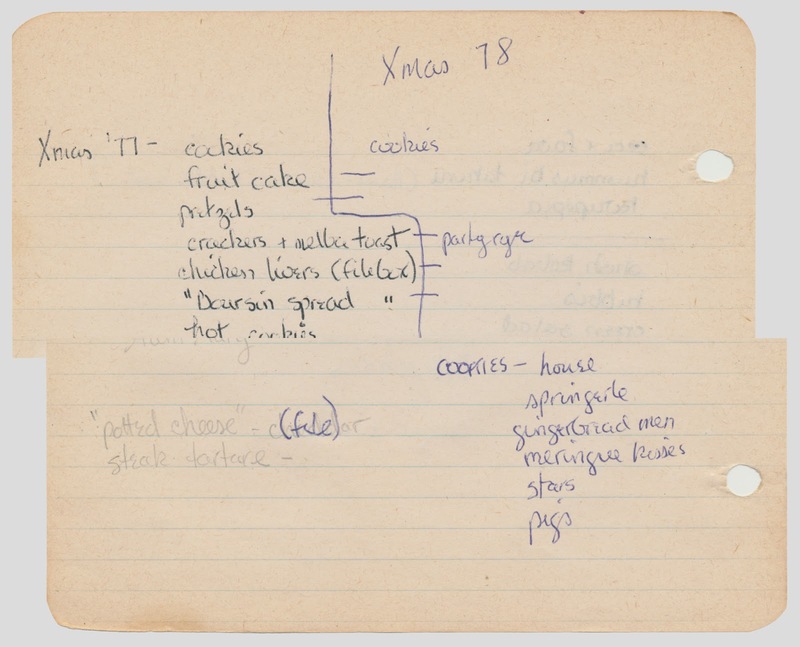 I found dozens of her dinner party notebooks, with recipes and invite lists and seating charts and budgets (!) and each one told the story of an event she threw with loving care. I wish they'd met -- our moms. Maybe they know each other now. Pigs.... over at the bottom of the list.